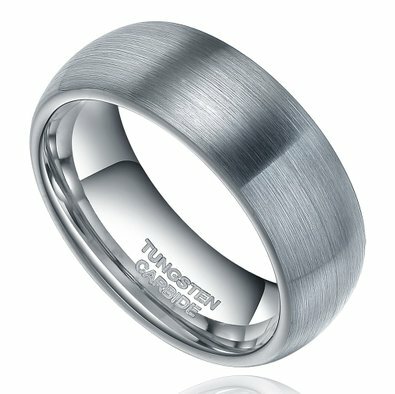 This timeless 8mm Brushed Classic style tungsten ring is sure to get many compliments! Q: I AM EXTREMELY HARD ON RINGS. TUNSGEN CARBIDE IS THE ONLY THINGS THAT I HAVE FOUND THAT DOES NOT SCRATCH. I LIKE THE MIRROR MULTI DIMENSIONAL ONES IN 8 MM. SIZE 6 AND 7. dO YOU MAKE THEM THAT SMALL? Yes, we sure do. We carry rings down to a size 2. If you need anything at all, please let us know. This was my 4th tungsten ring purchase and as ALWAYS the fit, quality and look are excellent. We recently ( July 9th, 2017 ) married and our wedding bands were tungsten and we are happy that we took that route! Thank you!!!! Ordered the wrong size and returned and replaced no hassle, fantastic service love the ring and very comfortable fit. GREAT PEOPLE TO DO BUSINESS WITH. Thanks! Great finish & fit - exactly as expected, Fadt delivery. My fiance loves this ring. We have looked all over the metro Detroit area and the internet. One day I found Tungsten Fashions online. This was exactly what we were looking for. This is the same great quality that you will find in the store but without the price. Shipping was very as well. Its comfortable and just the right color. Have the polished band in this style and love this new ring style to go along with my other ring. Looks awesome walking around Delray on a hot Florida night! Thank you! I have never had better customer support then this company! (because we couldn't get my husband's ring the correct size). They made sure we received our ring in time for the wedding!! High quality rings and exactly what we expected & wanted. I recommend this company any & every day!! It fits great, love the style and color. Thanks! Bought this ring for my husband to be and he loves it, it looks so smooth and fits perefperf! My fiance loves the ring. Originally we ordered the wrong size, but the return was so quick and painless. Absolutely loved working with this company!! The ring is very nice, my husband really likes it. Great quality. This ring will be my wedding band , it looks and feels great . The picture of this ring does not do it justice , it has a nice smooth brushed finish .